This homemade costume for kids entered our 2012 Halloween Costume Contest, and won 2nd place in the Favorite Halloween Costume nomination! I made this for my 2 year old out of felt and pajamas. It took FOREVER lol. It's pretty straight forward just cut the felt pieces in strips and hot glue them on to the PJ's. The hat is made out of thick cardboards and more felt. The ears are just cones made out of thick paper. I got the idea from online but there are not too many photos or instructions. 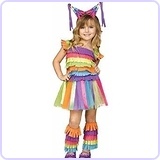 Check out the video tutorial below on how to make a pinata costume. This too cute! I may have to try it this year for my son. I love this! What a clever idea! Just curious, about how much felt did you use? I used about 30 sheets of regular paper sized felt. Wendi what did you use to make the hat? I love this costume and im going to make one for my son! Here is a youtube video of my costume and how I made it...I hope I am aloud to post this. Did you hot glue the felt on the body of it or did you sew? Hot glued it all...only cause I don't own a sewing machine and its only going to worn once. I'm attempting this for my 3 yr old..I decided to go with a two piece set instead of 1 piece pjs, but after doing the pants, I'm thinking I should have done the 1 Pc.. The pants are pretty heavy, so I'm looking for some kids suspenders :).. I'm about to start the shirt...but I'm dreading the hat, mainly cause I'm not sure how to shape it....thanks again for this great idea and for sharing. Oh ya I guess I never thought of the fact that the pants might get too heavy to stay up..hmm maybe if someone else tries it they might want to use pants with a draw string. I also did two pieces and made the pants using crepe paper instead of felt because we live in Florida and I thought the felt would be too hot. It worked out perfectly, and they are really light weight. Unfortunately though, I stopped there because my 2 year old son did not like wearing it because the pants i used were a tad bit small. LOVE this idea!! Too cute!! How wide did you cute the strips? I assume you cute long ways. It looks to me as curing into thirds? Would this be about right? I bought the felt in sheets which are the same size as a piece of paper. I did cut it the long way. I don't know what you mean by "curing into thirds"
Thank you for posting this. My daughter loved it, so we made it. My finger tips are a little burned from the hot glue but it looks AWESOME. the snoring in the background is hilarious! I am one proud mama... 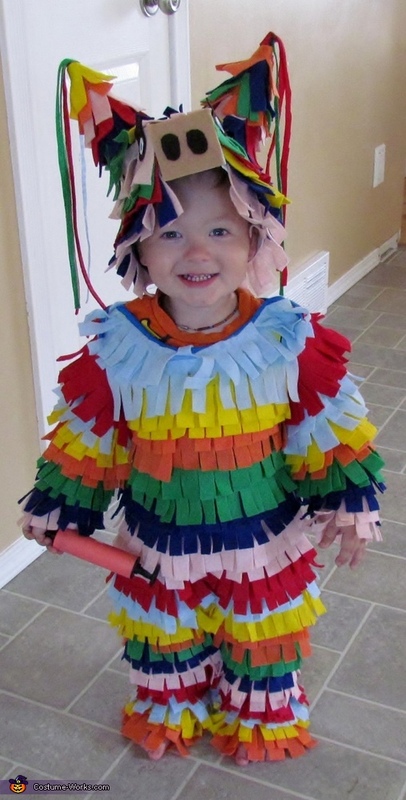 This was my first crafty project.. And no matter how many times I was asked where I got the idea of making a piñata costume, I never got tired of saying that I found it on Pinterest and followed Wendi's video :). Thank you again for sharing your idea, Wendi! Thank you, Im not sure how I am going to top this next year but I have a few ideas!! very cute and unique, great idea!!!!! So unique :) So cute, love it. What a great looking costume!!! He looks so adorable. I can't believe it is homemade! What a creative costume! Great job, he looks amazing! So creative!!!! He is adorable! What a cutie! :) Such a creative costume! Love this costume! Takes imagination to do this! There are some one piece PJ's that the top of them are wide enough that the child can slip them on through the head. The fabric on the top kind of folds over once the pj's are on if that makes sense. This is also common with undershirts for little ones. I found this was the easiest way to get the costume on and off but I guess if you found one with a zipper or snaps you could just sew or glue around the zipper or snaps and put it on your child that way. I am so making this for myself! Yes, I am 29, but hey, I can still have fun! Thanks for the tutorial video! How stinkin adorable is that!!! Just made it for my 3 1/2 year old. Used pj bottoms and a thermal top. Be aware that the top needs to be a few sizes bigger than the size they wear because once it's all felted up, there is no "give/stretch" to the clothing. I originally made it with the matching pj top only to find out it was not going to fit try as I did...and I think that if I had managed to get it on, I would have had to cut him out of it! So stinking cute and he LOVES it! I made this costume for my almost 5-year old son. It was a TON of work to make, but it looks AWESOME and has received so many great compliments. 1. I bought a pair of footed fleece pajamas from Goodwill. They were a little large for my son, which is good because the felt kind of binds up the suit once it's glued on, so without this extra space, he may not have been able to move very well (think Randy on "A Christmas Story"). Even now, he cannot sit in this costume - there just isn't enough give now that the felt is on there. I cut the feet out of the PJs, and since I wanted a seamless look, I had my son wear the PJs backwards so the suit zips in the back, rather than the front. 2. This suit is HEAVY (and for the record, it's also hot), so I wouldn't recommend doing it in a pant/shirt combo without a good plan to keep those pants up. 3. Buy your felt by the yard if you can. I used about 10 colors, at 1/8 yard each (give or take a bit - I actually bought 1/4 yard of each, but have quite a bit left over). I used a rotary cutter to cut the felt into strips that were about 2.5 inches wide, then I used the same cutter to make the fringe cuts. It took about 3 hours for this step alone. 4. I easily used 50 hot glue sticks on this costume. 5. This isn't a hard project, but it is a slow and tedious one. In all, I'd say it took a full 24 hours to complete(I wish I was exaggerating...I'm probably underestimating it). 6. 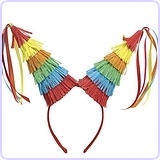 Once you have all the fringe glued on, take the time to gently stretch some of the fringe pieces to make them a little longer than the others so your fringe isn't all cut in exact straight lines...this helps make the costume look more like a piñata and adds some fun texture. 7. I used white craft cones for the horns on the hat...I didn't realize how heavy they'd be until I finished everything and it was too late. I would not recommend doing that. Make your horns out of the same foam paper you use to make the head piece so the horns don't weigh everything down. This costume is darling an unique, but it takes a RIDICULOUS amount of time and patience to make. Now that mine is done I think it was worth it...but there were many times in the middle of it, that I was cursing myself for ever even THINKING it was a good idea to try to make it. I'm in love with the results, but they were certainly hard won. I'm so excited... I just made the pants and top... hat tomorrow!! Yes, I'm 32 years old, but I work at a high school and I love to see the kids' faces light up for some fun! I bought old scrubs at our local goodwill and so far so great!!! I plan to carry around a stick and then toss out candy!!! :) Thanks for the awesomeness!!! Would it make the costume lighter if I used colored fabric instead of felt? Or even used a white bed sheet with painted or dyed strips? My daughter is 2 and we will be inside at a shopping mall. Yes it would make it lighter for sure. I am from Canada so when I made this costume I was thinking of walking outside in freezing temperatures. Hi Wendi - My name is Kristen and I work for ABC's The View in NYC. 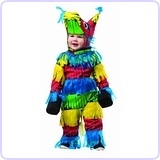 One of our producers saw this pinata Halloween costume and loved it! We would love to feature it in an upcoming show for Halloween. Please comment back as to how we can best reach you! Almost done making my son's costume! I saw a picture of this and just had to recreate it! I am so excited! The warm felt works perfect for us cause it gets very cold this time of year, I also have sewn it all by hand. Thanks for the inspiration! Can you tell me how wide you made the straps of felt? Did you do 3" wide straps? Or smaller..